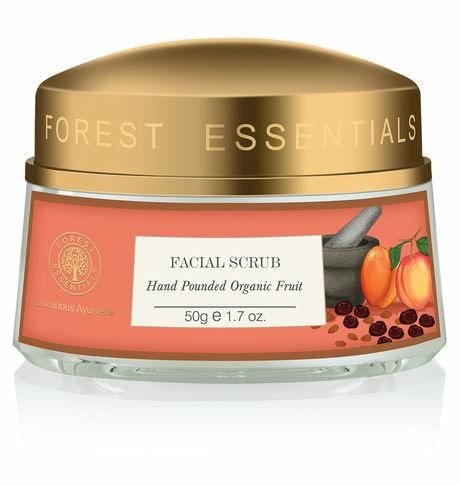 This nourishing face scrub, hand-pounded to the right consistency, blends fresh organically grown Dates, Peaches and Almond seeds with rich Apricot Kernel oil, pure Honey and finely milled Almonds to gently exfoliate dull cells, revealing a beautifully polished and glowing complexion. These ingredients are fermented by placing them in terracotta jars buried under the ground for many months, and then blended with herb, root and flower infusions to create a highly nourishing and deep cleansing scrub. This unique old Ayurvedic formulation uses a variety of fruits including Dates, Peaches & Apricots. These are left whole with wild Turmeric roots & Neem leaves & buried just below the surface of the ground in earthenware pots & covered with leaves that are changed from time to time. In about a month's time this fruit pulp ferments along with the roots and leaves, and becomes a rich mass of live organic matter with natural glycolic acid (Fruit Acid). This is then taken out, hand pounded & mixed with organic Honey, Apricot Kernel oil & finally with Sweet Almond oil to produce a rich cleansing and nutritive food for the skin.